Recently, Tijuana Flats supported Wounded Warrior Project® (WWP)­ by donating an evening of fun and food to warriors served by WWP. PALM BEACH, Fla. (July 11, 2017) – What’s better than a free meal? One enjoyed with family and fellow veterans at an event hosted by Tijuana Flats. 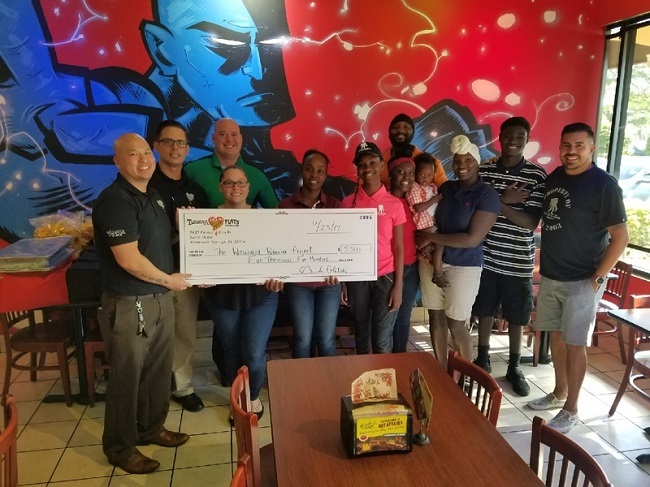 Recently, the Tex-Mex restaurant chain supported Wounded Warrior Project® (WWP)­ by donating an evening of fun and food to warriors served by WWP. Gatherings like this don’t just allow wounded veterans to enjoy delicious food – they’re also a chance to connect them with other local warriors who share their life experiences. Like many warriors served by WWP, Army veteran Rachel Heinz has found a renewed sense of purpose. Beyond the benefits of developing support structures and enjoying camaraderie with fellow veterans, she’s also found a chance to do something for other wounded warriors. Rachel’s journey with WWP began after she saw a commercial for the veterans charity on TV. However, she didn’t think she would be able to register with the organization because of how she was injured. At the dinner connection event, warriors shared stories – and a delicious meal. To learn more about how WWP’s programs and services connect, serve, and empower wounded warriors, visit http://newsroom.woundedwarriorproject.org. To find photos from this event, click on multimedia, then images.